Newspapers provide researchers more than birth, marriages and death notices. The social side columns are insights into the life and times of our ancestors by showing reports family visits, anniversary parties, galas, local elections and of course the tragedies like murders, accidents, etc. Locating the local paper is the next step whether the newspaper is in hardcopy, microfilm or online and here are tips on how to locate that elusive paper. Presenter: Trish Little-Taylor is a librarian and has been doing genealogy since 1978. She started learning about doing on her families while working at the Library of Virginia. In Ireland she began to do in-depth research on her Grandfather William Little who emigrated in 1901. As a result, she obtained Irish citizenship and an Irish passport. She has taught Irish genealogy classes at Brookdale Community College and did presentations at two Virginia Library Association Conferences. While at Portsmouth Public Library I spoke at workshops on various topics including African American genealogy. Genealogy is made up of a variety of fields. One of the lesser known research avenues are building histories. The history of home, business, or simple building can tell a researcher and amazing amount of information. In this presentation learn how to research the history of a building and how to use it in your genealogy. Research into Colonial North America can be extremely difficult, and at times highly specialized. This presentation will discuss the importance of history in your research, tips and tricks for finding early records, what records are available and where to find them, how to evaluate research materials for accuracy, and the use of social history to put ancestors in context. Presenter: Shannon Combs-Bennett is an award winning author and lecturer based in Northern Virginia. She presents on a variety of topics from methodology to DNA. Currently Shannon is earning her Master of Science in Genealogical, Heraldic, and Paleographic Studies from the University of Strathclyde. In addition to her free-lance work, Shannon is a staff genealogist at the National Society Colonial Dames 17th Century in Washington, D.C. Creating and using a chronology will help you to organize and use the facts you have collected in your research. This chronology, or timeline, will show you any gaps you have in your research. 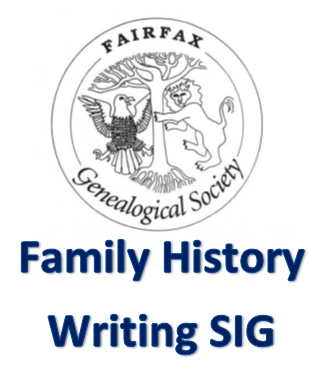 By adding historical context to your chronology, you will create an outline for your narrative family history. This historical context will add texture to your narrative. Presenter: Sue Mortensen studied history and genealogy at Brigham Young University and graduated with a Bachelor of Arts in History from Western Connecticut State University. She has over 30 years genealogical research experience, primarily researching her father’s line in Virginia and Missouri. She is currently working on a biography of her great-­‐grandfather, William James Hinchey, a somewhat famous Irish-­‐American artist. Wills are a treasure trove of information about our families. They identify immediate and extended family members and give us insight into the economic and social life of our ancestors. In other words, they tell a story. Probate packets can give us information about a family for decades after an ancestor has died, whether or not he left a will. Ashley Abruzzo will give a presentation called Germanna 101, which is an overview of the Germanna Foundation and the early German immigrants to Virginia. Contact SIG Leader Mark Lazaroff at mark.b.lazaroff@gmail.com for more information. 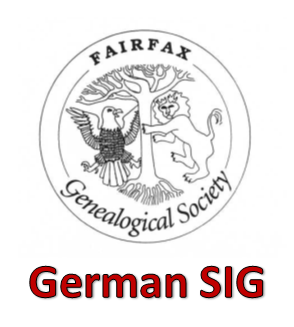 A full-day seminar on "German Genealogy" at the Balch Library in Leesburg, VA given by James Beidler. The pre-registration rate is $20 for members of Friends of the Thomas Balch Library and $25 non-members; $35 at the door. Lunch is on your own and handouts will be provided. For additional information, visit https://www.leesburgva.gov/Home/Components/Calendar/Event/28324/5632.